You've done quite well on kitty's training program: You feed her well, attend to her litter box and want to please her with toys -- she is, however, still working on that vet thing. Making catnip toys for your cat is inexpensive and easy. With a little trial and error, you'll learn exactly what kind of toys she prefers. When it comes to making a catnip toy for your cat, all you need is some spare material, scissors, dried catnip and needle and thread. Use your imagination and cut the fabric in different shapes and sizes for your cat, taking care that it's not small enough to swallow or too large for her to carry in her mouth. Cut two identical shapes from your fabric and sew them together tightly, leaving a space large enough to fill the toy with catnip. Stuff it tightly and sew the toy shut. 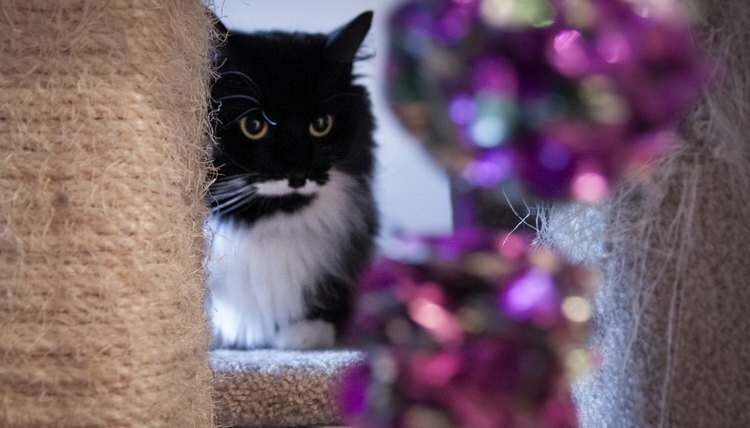 You can add feathers or bells to call her attention to her new toy, but be careful to avoid long string or other tempting things she may ingest, potentially causing her intestines to bind up. Choose a fabric that's sturdy enough to withstand your cat's claws and teeth, such as denim. If you don't have excess fabric laying about or aren't handy with a needle and thread, cut the top off a spare sock, pour a bit of catnip into the toe and tightly knot the sock.